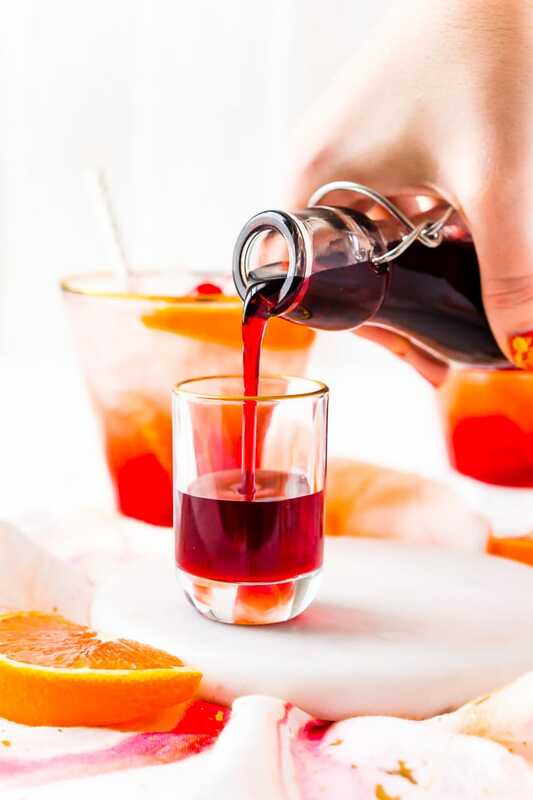 This recipe for Grenadine Syrup allows you to make this fresh and flavorful cocktail syrup right at home. Made with pomegranate juice, sugar, and lemon juice, it’s ready to use in about 30 minutes and tastes so much better than that store-bought stuff! Many of us probably first had Grenadine Syrup as a component of Shirley Temple or Roy Rogers drinks growing up. It’s hard not to love this sticky red syrup that makes everything taste better. It’s a common misconception that it is a cherry syrup, did you actually know that the true recipe is made from pomegranates? In fact, it’s derived from the French word grenade which means pomegranate. But most store-bought versions are primarily high fructose corn syrup and red dye with artificial flavors and they just don’t touch the real thing! Unlike traditional simple syrup, this cocktail essential adds more than sweetness, it has a really delightful flavor too! And the real thing is EASY and CHEAP to make at home! Originally, this popular bar syrup included pomegranate juice, water, and sugar. My version swaps out the water for extra pomegranate juice and adds a touch of lemon juice to really bring the syrup to life! 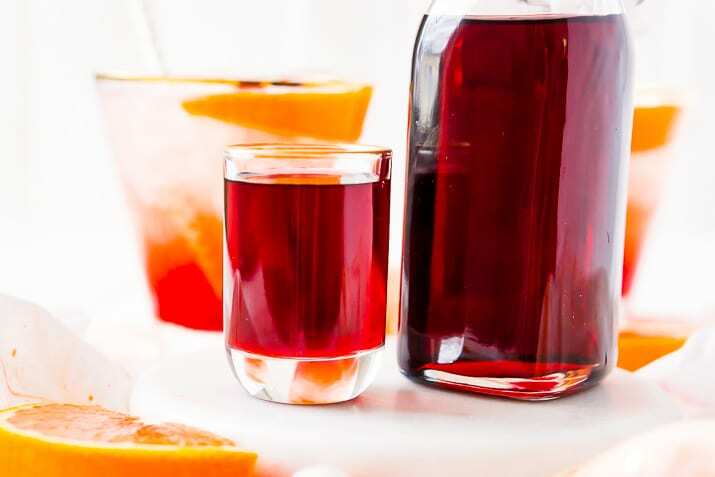 This homemade grenadine recipe doesn’t require much time to make and it will last up to a month in the fridge, although mine never lasts that long. 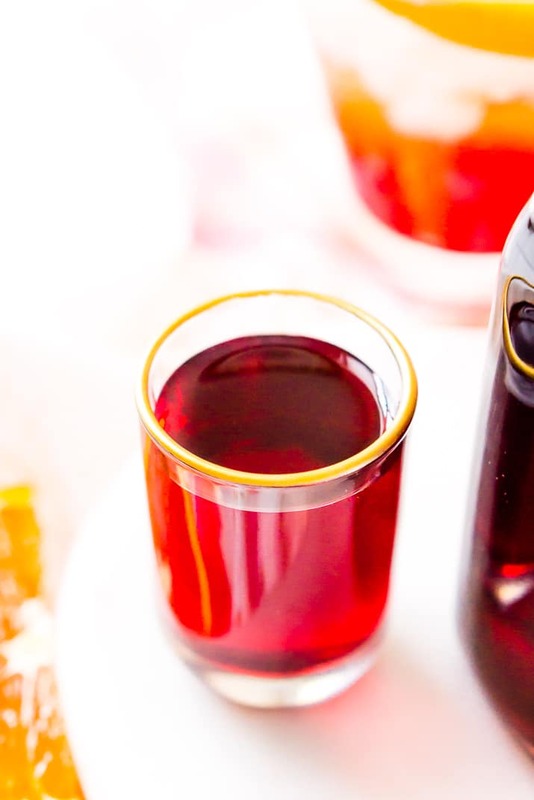 It is a syrup made with pomegranate juice, granulated sugar, and lemon juice. Combine the ingredients in a medium pot and cook over medium heat until the edges of the liquid begin to bubble and sugar is fully dissolved. DO NOT BOIL. Remove from heat and allow to cool to room temperature before bottling up. The syrup will last for about 1 month in an air-tight bottle in the refrigerator. Saucepan – This is my favorite saucepan, it’s nonstick and easy to clean which makes it great for making syrups in. Whisk – A spoon will work too, but I really like using a whisk to keep the sugar moving to make sure it doesn’t stick to the bottom of the pan. Funnel – A funnel will make it much easier to pour the syrup from the saucepan into the bottles. 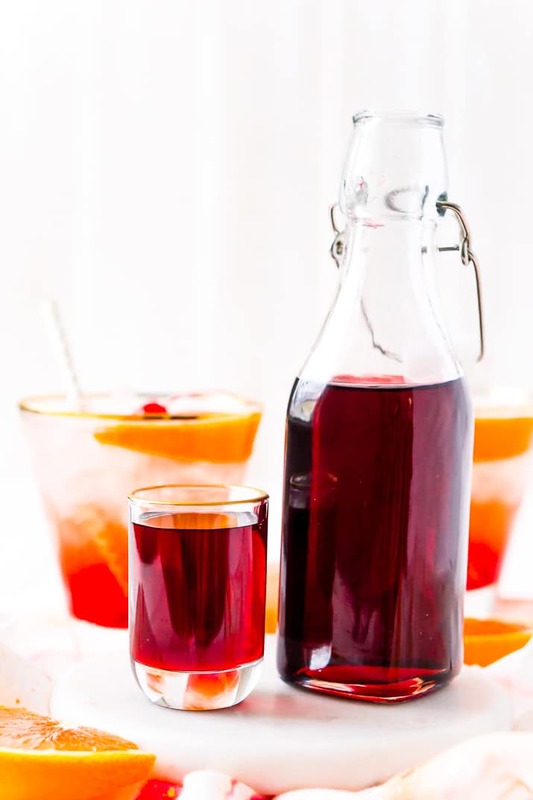 Bottles – These bottles are my favorite for homemade simple syrups, they have a pressure seal that keeps air out of the container and ensures the syrups will last. Make this fresh and flavorful cocktail syrup right at home. Made with pomegranate juice, sugar, and lemon juice, it's ready to use in about 30 minutes and tastes so much better than that store-bought stuff! Grenadine will last for about 1 month in an air-tight bottle in the refrigerator. 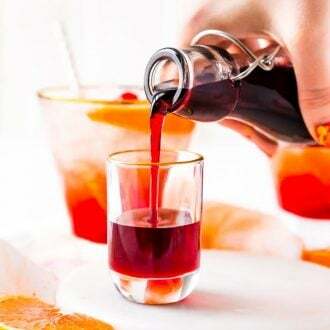 Wow, I never thought about making grenadine before, but now you have inspired me, thanks so much for this delicious recipe!! Yes! Do it, to taste so much better and it’s so easy to make! I’ve never tried making grenadine syrup before but now I have to! This looks so incredible! I made the syrup. Easy and yummy. Thanks!